In January 2016, CatCuddles were contacted about two young kittens who had been abandoned outside of the PDSA Animal Hospital in nearby Thamesmead. With it being just a few weeks since Christmas, it was not difficult to deduce that they were unwanted gifts. In the period following the festive season we always see a small surge of kittens. We were very full at the time and our funds were stretched thin by an influx of strays, but nevertheless we brought the pair in, a boy and a girl who were around 8 weeks old, immediately. We found that despite their ordeal, they were among the most mischievous kittens we'd ever encountered, with rambunctious, playful personalities. The girl in particular was very clever, interested in everything and always looking for opportunities to make trouble - with her brother following close behind. 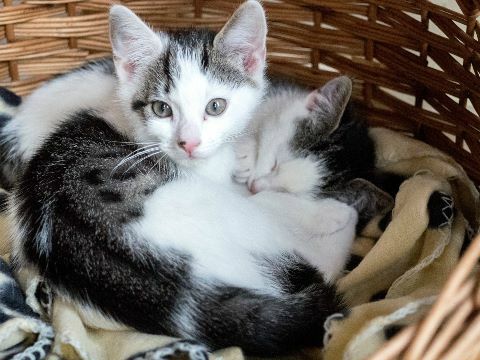 Over a year since they were discarded on that cold night, the siblings are thriving, their lives a million miles away from what they could have been. Adopted a few months after they came to CatCuddles and named Mylo and Lyra, they love their new home and are loved intensely. Though much bigger now, they are also still the best of friends and are still mischievous. They are happy. We want to continue to save lives in and around Greenwich, but the council have recently revoked our planning permission, which will prevent us from doing so. Please sign our petition.